Optic neuritis is the inflammation of the optic nerve. In the majority of cases, optic neuritis treatment is not required because the inflammation resolves by itself over several weeks to months. However, in certain circumstances, treatment may be required to hasten recovery. In most cases of demyelinating optic neuritis, no treatment is required. This is because the inflammation will resolve by itself and your vision will slowly recover and improve over 6 to 12 weeks. So the current prevailing opinion is that you should not subject yourself to unnecessary and potentially toxic medications for a condition that will get better by itself. However, you will still likely have some residual visual deficit even after you recover. Unfortunately, there is currently no optic neuritis treatment method that can improve how well you eventually see once the inflammation settles. If you have multiple attacks of optic neuritis, you are likely to experience some degree of long-term vision loss regardless of what types of treatments you receive. While demyelinating optic neuritis occurs most commonly, various infections from bacteria and viruses can also cause optic neuritis. Bacterial infections include tuberculosis, toxoplasmosis, syphilis and Lyme disease. Viral infections include herpes zoster and HIV. Sometimes the infection can spread to the optic nerve from pre-existing meningitis or sinusitis. When there is an underlying infection, blood tests and other investigations will be required to determine the causative organism. Once the organism is identified, the infection should be treated with the appropriate antibiotic or anti-viral as soon as possible. 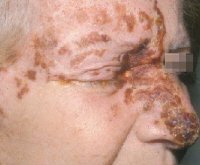 Herpes zoster ophthalmicus or ocular shingles, is caused by the herpes zoster virus, the same virus that causes chicken pox. Apart from optic neuritis, it can also cause other eye problems such as conjunctivitis, glaucoma and uveitis. The Optic Neuritis Treatment Trial (ONTT) was a large multi-center trial that researched the role of corticosteroids (or steroids for short) in optic neuritis. It found that intravenous administration of steroid did not make any difference to the final visual outcome at 5 years when compared with no treatment nor did it protect from multiple sclerosis over the long term. What steroid therapy did was to speed up the recovery process. The ONTT also found that oral steroids alone caused an increased rate of recurrence of optic neuritis. Unfortunately, steroids also cause a wide-range of side effects. In the eye, steroids can cause the lens to become opaque and form a cataract. They can also elevate the eye pressure sufficiently to cause damage to the optic nerve, thus leading to glaucoma. Elsewhere in the body, steroids can weaken your bones and cause osteoporosis. They reduce the ability of the body's immune system to fight against infection. They can significantly affect blood sugar control for those with diabetes mellitus. They will make you more prone to high blood pressure and gastric ulcers. Steroids are also likely affect your sleep and mood. You must not take steroids without appropriate cover if you have an active infection. Make sure you discuss your health condition with your ophthalmologist first before you start on steroid medications. If you are started on steroids, it is important that your eyes and general health are monitored throughout the duration of steroid therapy. Plasma exchange (plasmapheresis) is a form of treatment where plasma (the fluid component of your blood which contains antibodies) is separated from your blood cells by a centrifuge. Your blood cells are then returned to you while the plasma is discarded and replaced with other fluids. Plasma exchange is performed with either one or two intravenous catheters. Approximately 300 mls of your blood will be removed, filtered and then infused back to you. This can be performed using a dialysis machine for kidney failure patients. Plasma exchange works by temporarily clearing the blood of antibodies that attack the myelin sheath. This helps to stop further demyelination and inflammation of the optic nerve. It is sometimes used if the optic neuritis does not improve despite steroid therapy. Plasma exchange may help in up to 70% of those with severe, unresponsive optic neuritis. Immunoglobulins administered intravenously were thought to be able to stop or even reverse the demyelination process in optic neuritis and multiple sclerosis. Unfortunately, trials have generally found intravenous immunoglobulins to have no clinical benefit. However, with sustained pulsed dosing, intravenous immunoglobulins may benefit those with optic neuritis that is resistant to steroid therapy. Interferons are proteins that are naturally produced by the immune system. They play an important role in maintaining immunity of the body against viral infections and tumors. There are 3 major types of interferons: Type I, Type II and Type III. Interferon β belongs in the Type I class of interferons. Large multi-center trials, such as the Controlled High-risk Avonex MS Prevention Study (CHAMPS) and Early Treatment of MS Study (ETOMS), have found that interferon β may prevent or delay the onset of multiple sclerosis symptoms. It can also delay or reduce the accumulation of brain lesions on MRI scanning. This treatment is most beneficial if you have optic neuritis associated with 2 or more brain lesions on MRI (i.e. you are considered at high risk of developing multiple sclerosis). 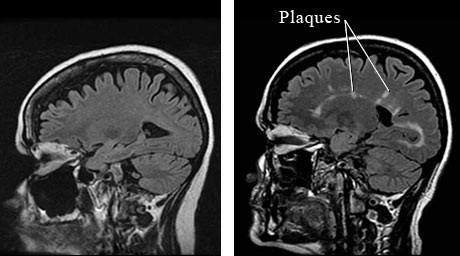 Magnetic resonance imaging (MRI) head scans of a normal person(left) and of a multiple sclerosis sufferer (right). The white plaques and spots scattered in the brain are characteristic of multiple sclerosis. Interferon β medications are given as subcutaneous injections. Interferon β-1a is sold under the trade names Avonex, Rebif and CinnoVex. Interferon β-1b is sold under the trade names Betaferon, Betaseron, Extavia and Ziferon. Unfortunately, interferon β therapy is not free from side effects. Most commonly, you will develop flu-like synptoms (low-grade fever, chills, headache, muscle and joint aches, fatigue, and weakness). They are usually worse in the first month and diminishes as treatment progresses. Interferon β can also cause tissue damage at the site of injection, mood disorders, problems with sleeping, thyroid dysfunction and suppression of the immune system. You will require regular monitoring of your general health if you are started on interferon β therapy. Fingolimod (or Gilenya) is a sphingosine-1-phosphate receptor modulator medication that has been newly approved for the treatment of relapsing-remitting multiple sclerosis. The FREEDOMS trial and TRANSFORMS trial have shown fingolimod treatment to be effective in reducing the relapse rate and in slowing down disease progression. Its efficacy in treating optic neuritis is currently being investigated (this includes a trial that directly compares fingolimod versus interferon β). In 2008, Dr Paolo Zamboni hypothesized that poor drainage of venous blood from the brain contributed towards the development of multiple sclerosis. Based on color doppler ultrasound scanning of multiple sclerosis patients, he found abnormal veins in the neck which were too narrow to drain blood adequately from the brain. He called this chronic cerebrospinal venous insufficiency (CCSVI). 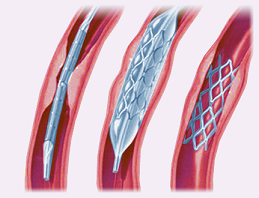 Treatment for CCSVI is aimed at restoring normal venous flow from the brain. This can be achieved with angioplasty or 'liberation procedure' - essentially dilating the abnormal, narrow veins with balloons and/or stents (see right). The internet is awash with stories of many multiple sclerosis sufferers benefiting greatly after treatment. However, Dr Zamboni cautions that it is not a cure for multiple sclerosis. There have been those who have not benefitted from treatment. Furthermore, as with all procedures, the treatment carries potential risks which include brain hemorrhage, heart damage and death. This has become a contentious and controversial issue, particularly as researchers have also found CCSVI in normal healthy people as well as those with other neurodegenerative disorders. Multiple trials are now being conducted to investigate the efficacy of liberation therapy and the relationship between multiple sclerosis and CCSVI. As far as optic neuritis is concerned, there is currently no information available regarding any possible link between CCSVI and optic neuritis. There is also no data about liberation therapy and the role it plays in optic neuritis treatment. If liberation therapy were to work, it would most likely be to reduce the risk of further episodes of optic neuritis rather than to stop any active optic nerve inflammation that is currently occurring. Have A Story About Your Optic Neuritis? Have you recently had optic neuritis? Was your treatment how you thought it would be, or was it totally not what you expected? Why not share your experience of with other readers? Entering your story and experience is easy to do. All you have to do is just to start typing!